Taking food photography is already difficult, but working under too warm or too cool conditions adds insult to injury. Despite your best efforts, the temperature can seriously affect the food you’re trying to shoot. You can take some precautions to keep temperature-sensitive foods, like chocolate and whipped cream, from melting and causing messy problems during a food shoot. Chocolate can translate so well in photos, but sometimes it is a bit challenging to shoot, and certain types of chocolate can be highly dependent on external conditions. Also, when shooting chilled dairy foods, such as whipped cream and ice cream, the key factor to keep in mind is the temperature of both the product and environment. Working with chocolate can be a little tricky, so when photographing chocolate candies or cakes, you have to consider a delicate balance of temperature. Chilled chocolate can produce some beads of sweat, while slightly warm chocolate shows every touch and threatens to melt over everything. You want to try for somewhere in the middle when shooting images of chocolate. Don’t use your fingers when moving or placing chocolate for a shoot. Our bodies are warm as it is, so when shooting under hot lights, even a gentle nudge can put an unwanted fingerprint on the chocolate. If you need to move the chocolate, use a spatula, spoon, or tongs. A fingerprint on chocolate can ruin an otherwise delicious image. When working with heated chocolate, such as the fondue in the following figure, make sure to warm it periodically in a fondue pot or double boiler. If the chocolate gets too cool, it can start to solidify quickly and form an unattractive crust. Melted chocolate can be so shiny that it clearly reflects every light source. Be aware of how the reflections appear through your viewfinder. Natural light streaming through a window or a nice, white soft box looks wonderful as a reflection. 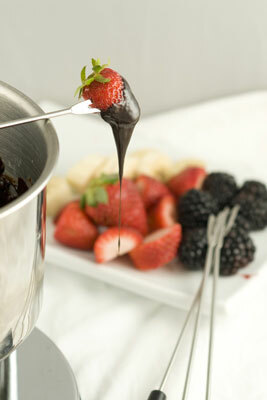 Keep chocolate fondue warm so it doesn’t form a crust. Shooting with whipped cream can be a mixed blessing. If you’re able to move fast enough to get the right shot, it looks absolutely gorgeous. When it works, you get light falling on the delicate swirls or dollops of goodness that can really translate beautifully to an image. When it doesn’t work, however, you very quickly get a slippery, sliding mess that melts, separates, and bubbles. When shooting with whipped cream, make sure the room temperature is as cool as possible to maintain the food’s structure for as long as possible. If the room is too warm, the whipped cream can become an instant mess (see the following figure). Whipped cream melts quickly under hot lights! Change your lighting: Instead of using heat-inducing continuous lighting, natural or strobe lighting may work best in this situation. It makes for cooler conditions that extend your shooting time. Substitute sour cream: Sour cream is a great alternative to using whipped cream. Sour cream is a fairly robust food double that can handle light and heat like a champion. In the following figure, the more delicate whipped cream is replaced with sour cream. 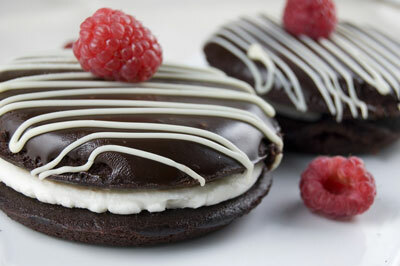 The image looks creamy and delicious with none of the adverse effects of working with whipped cream. 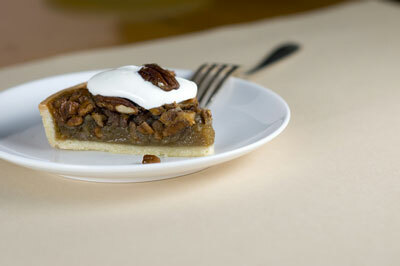 Using sour cream as a whipped cream stand-in provides the same look without the melting mess. Try tiny toppings: If you’re using fruits or other toppings, try to make them whisper thin. Doing so shows them as beautiful toppings but without all the weight of the chunkier portions. 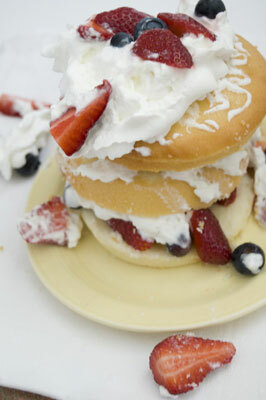 Use a dollop: Use a dollop of freshly whipped cream, rather than squirting from a whipped cream can. These spoonfuls are less delicate and hold out longer for your photos. Work quickly: One of the key factors to remember is to work very fast when shooting whipped cream. You have only a few minutes to get the needed shots.